There are 165 Assisted Living Facilities in the Orange area, with 18 in Orange and 147 nearby. The average cost of assisted living in Orange is $3,202 per month. This is lower than the national median of $3,346. Cheaper nearby regions include Santa Ana with an average starting cost of $3,197. To help you with your search, browse the 448 reviews below for assisted living facilities in Orange. On average, consumers rate assisted living in Orange 4.2 out of 5 stars. Better rated regions include Villa Park with an average rating of 4.5 out of 5 stars. The city of Orange is nestled within world-famous Orange County. Seniors may appreciate the Southern California lifestyle with 42 miles of beaches, Knott’s Berry Farm and the original Disneyland Resort. Along with all of the local entertainment, seniors can choose from 18 Assisted Living Facilities (ALFs) within Orange city limits, and 45 in the surrounding area. The state of California considers facilities that have at least 75 percent of residents over 60 and provide some level of assistance and supervision as Residential Care Facilities (RCFs). These facilities may assist residents with services such as medication regulation or storage and activities of daily living. The Department of Social Services, Community Care Licensing Division (CDSS) is responsible for the licensing and regulation of these facilities. Orange has a great climate for seniors to enjoy. There is an average high of 85 degrees in July and a warm average low of 46 degrees in January, with zero inches of snowfall. Seniors with limited mobility can be active all year in this climate. Seniors may feel secure in this area due to the low crime rates. Orange has a violent crime rate of 28.4 out of 100 (1 being the safest), which is lower than the national average of 31.1. The property crime rate is at 28.4, quite a bit lower than the national average of 38.1. Orange County is a member of the AARP Network of Age-Friendly Communities, meaning that its elected leadership “has made the commitment to actively work toward making their town, city or county a great place for people of all ages,” according to AARP. Orange County received a very poor air quality rating of F from the American Lung Association. Seniors with respiratory health concerns may experience difficulty in this area. Seniors looking for some wildlife entertainment can join one of the year-round tours at Captain Dave’s Dolphin and Whale Watching Safari, where the boats have underwater viewing pods that enhance the experience. Orange is part of the Senior Mobility Program, which is a part of the OCTA transportation bus line. It provides extra transportation services to fill the holes in public transit for doctors appointments and shopping needs. Assisted Living costs in Orange start around $3,202 per month on average, while the nationwide average cost of assisted living is $4,000 per month, according to the latest figures from Genworth’s Cost of Care Survey. It’s important to note that assisted living rates in Orange and the surrounding suburbs can vary widely based on factors such as location, the level of care needed, apartment size and the types of amenities offered at each community. 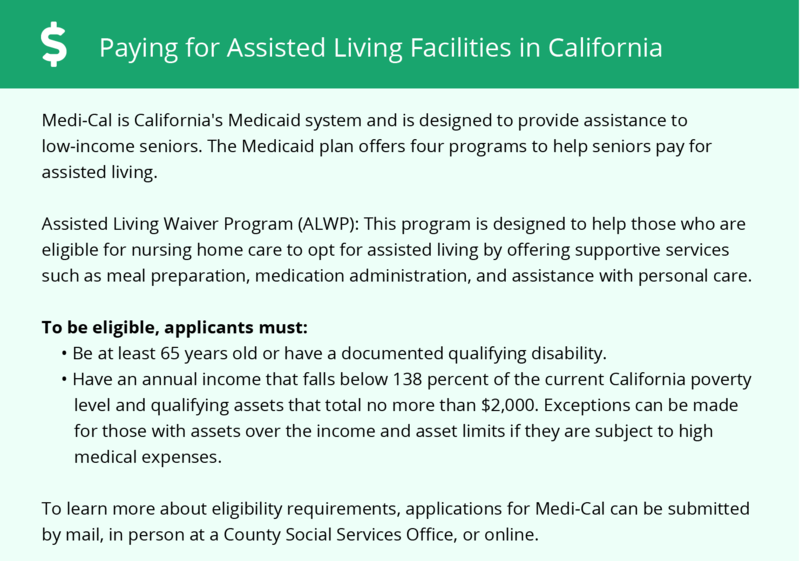 California’s Medicaid program, Medi-Cal, offers financial assistance to help impoverished seniors cover the cost of assisted living. 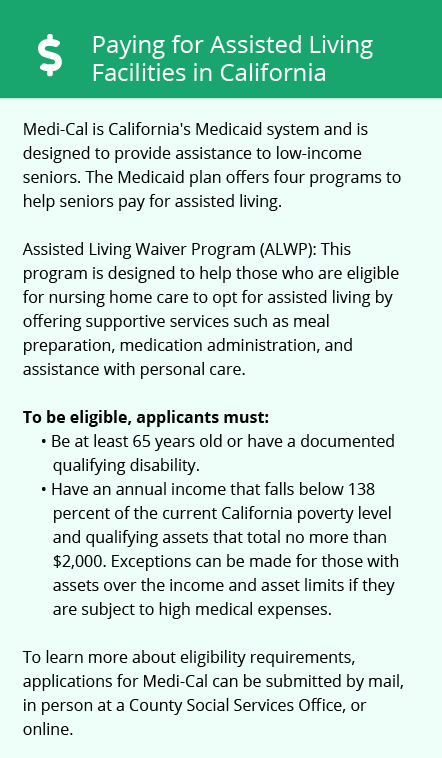 Those who are eligible may be able to take part in the state’s Assisted Living Waiver Program (ALWP). Orange and the surrounding area are home to numerous government agencies and non-profit organizations offering help for seniors searching for or currently residing in an assisted living community. These organizations can also provide assistance in a number of other eldercare services such as geriatric care management, elder law advice, estate planning, finding home care and health and wellness programs. To see a list of free assisted living resources in Orange, please visit our Assisted Living in California page. Orange-area assisted living communities must adhere to the comprehensive set of state laws and regulations that all assisted living communities in California are required to follow. Visit our Assisted Living in California page for more information about these laws.